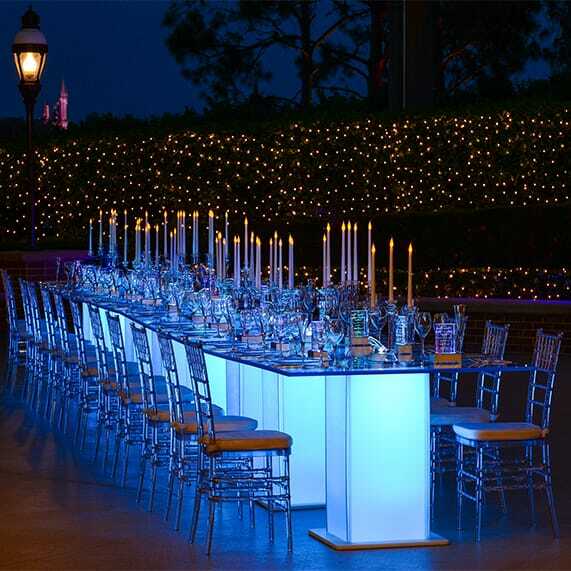 Dine like royalty at your Disney's Fairy Tale Wedding and transport your guests into the alluring and sparkling world of Cinderella for an evening you'll never forget. This customized table from Tables By Design will bring fantasy into reality by creating a dream like ambiance in pure crystal, lucite and glass. The centerpiece is your very own crystal storybook menu which glows and is engraved with your name on its spine and the evening's menu on its cover- a perfect keepsake for the storybook feast. Of course, the highlight is the succulent and richly layered feast designed by our world-class chefs. Whether it's your wedding reception, bridal tea party or rehearsal dinner no need to worry about the clock striking midnight at this ultra sophisticated fairy tale soiree. This offering is only available at Walt Disney World only, and be sure to ask your Disney Wedding Planner for more info and pricing details. Ready to begin creating your very own happily ever after? Request a free Disney's Fairy Tale Weddings & Honeymoons planning guide today.